After 17 years Ed Caraher, our veteran centre retires from senior rugby. I caught up with the 2012 “Players Player of the Year” after his last game. How did it feel to play your last game Ed? I am delighted knowing I’m never going to feel the post match pain again. 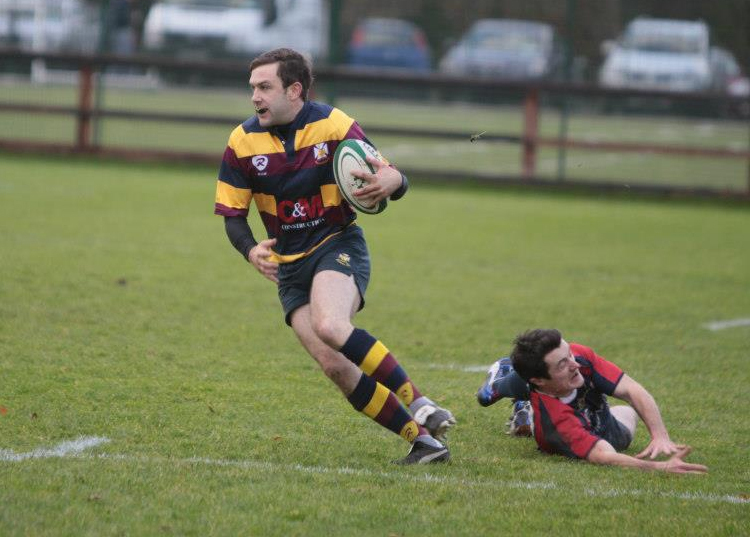 What’s your best memory of playing rugby for Skerries? Coming out onto the pitch in Lansdowne rd for the 1998 cup final. The whole of Skerries must have been at that game. The atmosphere was incredible. I was only 20. Which game was your most memorable and why? My most memorable game was probably beating Monivea in the final of the round robin last year to regain our senior status. I was playing in Banbridge the day we were relegated so to still be involved when we went back up meant a lot. What will you do with your Tuesday evenings, Thursday evenings and weekends now? Patsy has roped me into helping out with the 2nds next year, so my Tuesdays and Thursdays are still going to be spent in Holmpatrick. I’m not going to miss having to do the fitness sessions, I’ll probably get some sadistic pleasure from conducting them. Ed played 3rd a’s, b’s, 2nds and 1st team with such club legends as Jammer Carr, Pipes Dungan, Sumo, Alan Molloy, Louis Carron and Horse Downey. On behalf of Skerries Rugby Football Club we would like to thank Ed for his time and dedication to the club over the past 17 years.